Steve Lassman, Vice President of Villa Product & Agency Relations for Villas of Distinction accepts the Travvy Awards. We wouldn’t have received one, much less two Travvy awards without the support of our travel partners. I can’t thank them enough for their ongoing commitment to our brand. Full-service premier luxury villa provider Villas of Distinction®, as part of World Travel Holdings, has won a second consecutive year Gold and a Silver Travvy in the Best Villa Rental Company Overall and Best Vacation Packager, Luxury categories, respectively, at the 2018 Travvy Awards hosted by travAlliancemedia. This is the third year in a row that Villas of Distinction has been recognized in the Travvys. Villas of Distinction was recognized for its commitment to providing its guests with more than just a villa stay, but planning a completely customized destination vacation experience. Each guest is provided with a personal concierge to arrange every aspect of a vacation. Villas of Distinction has created countless, truly unique experiences for birthdays, wedding proposals, weddings, anniversaries, family reunions and more. 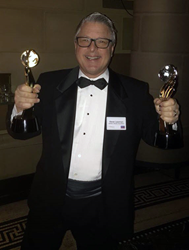 The annual Travvy Awards—known as the Academy Awards of the travel industry—were held Wednesday, Jan. 24, 2018 at Gotham Hall in New York City to recognize the highest standards of excellence in the travel industry by honoring travel companies, travel products, travel agencies, and destinations for their outstanding achievement. For more information, a breakdown of categories and to view the full list of winners, please visit http://www.TravvyAwards.com.